Oats Oothappam, an ideal dish for breakfast with all necessary nutrients. 1. Soak the oats for 5 min in enough water. Grind it to a smooth batter with some sour yogurt. 2. Take the oats mixture in a mixing bowl. Add Sooji Rava, hing, salt and make into a batter. Keep this aside for half hour. Mix well, finely chopped onions,grated carrot and coriander in a bowl and keep it aside. 3. Smear oil on a hot tawa(Iron cast / Non Stick), pour a ladle of batter and spread lightly like how we do for Oothappam's ( thicker than normal dosa's). Pour oil over and around the corners of the dosa. 4. Quick Sprinkle the onion mixture all over the Oothappam and cover it with a lid and let it roast over medium high flame until the edges are golden brown in color. 5. Slightly press the onion mixture all over the Oothappam with a spatula, pour some oil over it. Turn to the other side and roast on the other side. Remove the Oothappam from the tawa and serve directly on to the plate. 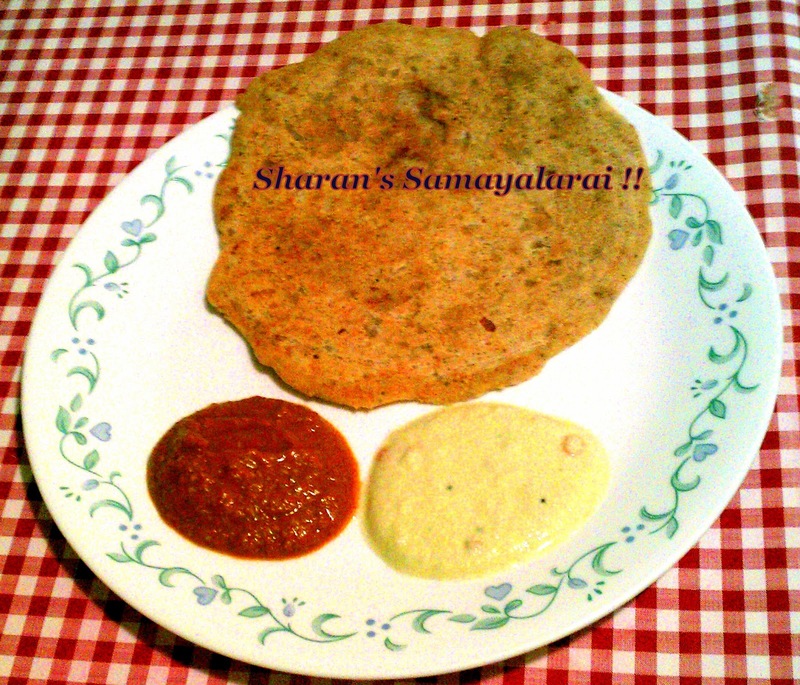 Serve the Oothappam piping hot with coconut chutney/peanut chutney or chutney of your choice. # The toppings are basically your choice,you can even add finely chopped tomatoes or colored bell peppers or finely chopped mushrooms.I just happened to use whatever was readily available at home. # In order to make the Oothappam's bit more tasteful, sprinkle some Idli/Dosa podi (kaarappodi/Milagai podi) all over along with the other chopped vegetables. # I added a table spoon of Sooji rawa to make the Oothappam's crispier,it is optional to use it. # The batter turns very thick quickly, so keep checking the consistency and add water if required in order to get nice and crispy Oothappam's. # Ensure the batter is like Oothappam batter. If the mixture is bit hard then add some water in it. Adjust the consistency accordingly. Looks yummy and healthy too. Lots of rolled oats in my pantry...going to make this today. Thanks for the recipe.